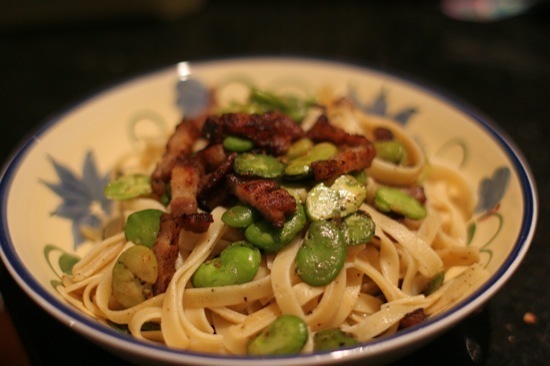 Here’s a quick and easy recipe that’s really delicious – broad bean and bacon fettuccine. When we pick broad beans (fava beans) in spring, I blanch and freeze a lot of them. They’re great to add to soups and casseroles through the winter, and you do get a bit sick of fresh broad beans in the spring if you’ve grown a lot. I freeze them in muffin trays, then once they’re solid I transfer them to a freezer bag. It keeps them in individual portions that are easily separated, without the waste of wrapping them all individually. First, get your water boiling and get the fettuccine on. It takes about 12 minutes to cook, which is just enough time to get the rest of the dish ready. Fry a couple of rashers of bacon in a frypan. Once done, remove it and let it sit on a paper towel to drain some of the fat. 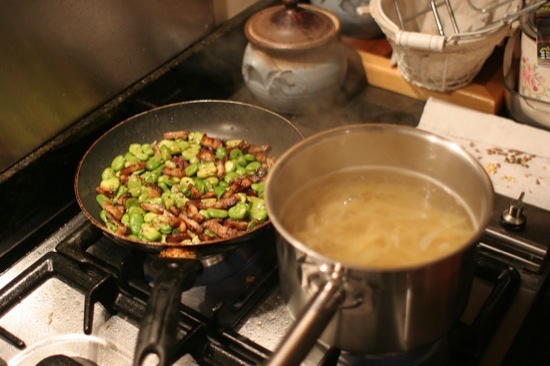 Now fry about 1-2 cups of shelled broad beans in the bacon grease. Toss in a couple of cloves of crushed garlic if you like it. While that’s cooking, chop the bacon into short strips. Return it to the frying pan when the broad beans are ready, and season with freshly-ground black pepper. Drain the pasta and return it to the saucepan. Tip the broad beans and bacon in and toss. You can add chopped parsley at this point if you like (I didn’t this time, but sometimes do). Serve into individual pasta bowls and top with freshly-shaved parmesan. The whole thing only takes about 15-20 minutes to make, and tastes great! For a richer variation, you can add a good dollop of cream to the broad beans before adding to the pasta. Do you have any favourite broad bean recipes to share? I love broad beans in a Minestrone that I make in the pressure cooker. They turn very soft after 30 minutes and add a wonderful flavour to the soup. Did you double shell the beans for this recipe? @Gavin: Sounds good! Yep, I double-shelled the beans before I blanched and froze them, as they were a bit big. I normally don’t bother with the inner shell, but my wife won’t eat them unless they’re fully-shelled! In a saucepan, heat the olive oil then add the onion and bacon and fry until the onion softens (about 5 minutes) stirring occasionally with a wooden spoon. Toss in the prepared broad beans and cook, with the lid off, for about 5 minutes more. Serve immediately as a side dish. Note: this dish can be served as an almost-vego meal on its own. Just increase the quantities for more people. This dish serves 2 people. Gail, that sounds like a good recipe! I’ll have to give it a try. Thanks!